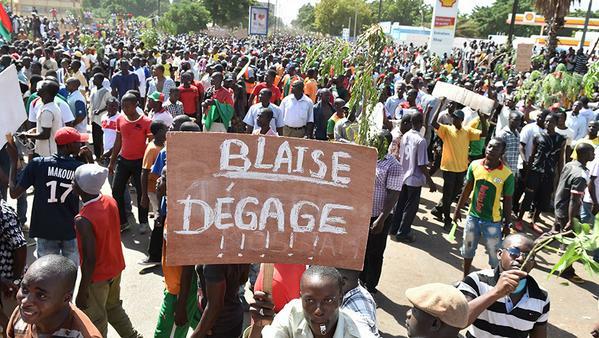 OPEN LETTER TO PRESIDENT BARACK OBAMA / by EUGENE DIOMI NDONGALA | Démocratie Chrétienne, D.C. I am writing to you in the name of freedom of speech, civil and political freedoms, as universal values flouted in Democratic Republic of Congo. 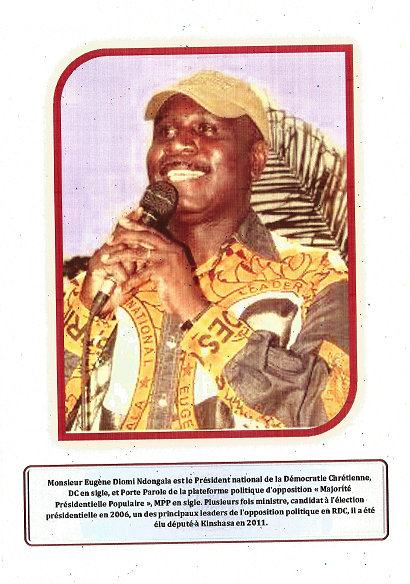 For this purpose, I want to submit to your attention the case of political prisoners languishing at this time in “death houses”, which are the congolese prisons, because of their political opinions. With this in mind, I ask you to take immediate actions according to your last message to United States Congress, concerning Congo Kinshasa, in order to protect the peace and right of political alternation as the fundamental element of a true democracy. 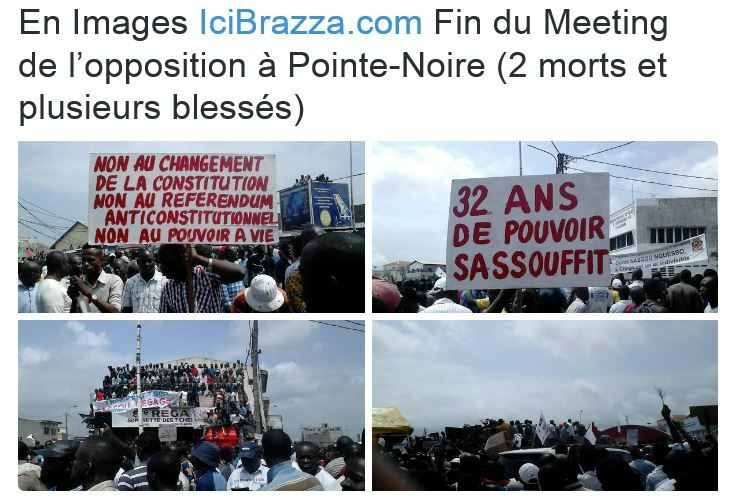 The last presidential and legislative election that occurred in Congo in November 2011, have been characterized by fraud and lack of credibility of the results published by the electoral commission. I believe that the current conjectural majority lack of Legality, Legitimacy and even Opportunity to amend the fundamental law in order to sustain in power. It is necessary that a real national debate take place on the limits of power after questionable and contested elections as well as the necessity to respect the fundamental rights of Congolese citizens who continue to be victims of this unfair government. A debate that your administration should support, in the respect of the resolution 2098/ 2013 of CSNU, to promote peace an democracy in DRC, those values that have a real importance for your administration. You have shown it in your last message to the Congress concerning DRC and his subsequent Order. 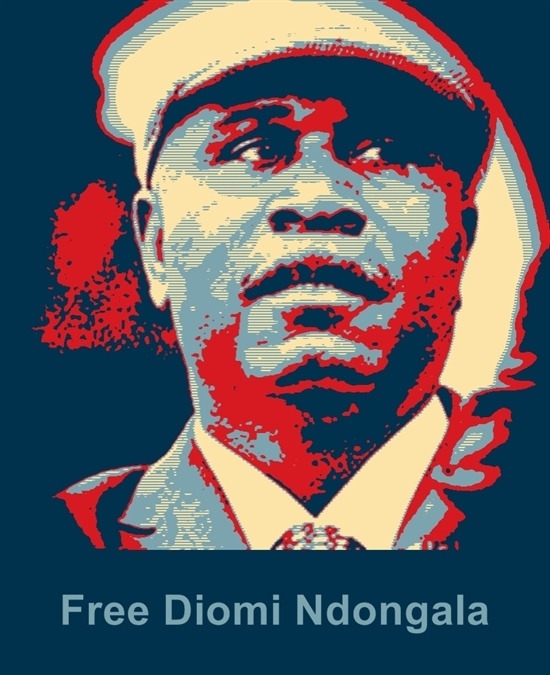 It would be impossible to talk about democracy and human rights in Congo without mentioning the issue of political prisoners, a category of Congolese citizens to which I belong because of my claim of election transparency in DRC. The tentative to obstruct my freedom of movement, whereas I was an elected deputy of the city of Kinshasa in the ranks of the political opposition, my illegal invalidation as national deputy, the violation of all my rights in order to neutralize me through a parody of trial that were unfair and disrespectful of the rights of defence, all these persecutions have led to a rogue sentence that constitutes a violation of the obligations to which the DRC is subject under the international law. Additionally, I am subject to physical and moral tortures and the will of my torturers to place my family in a situation of “civil death”. 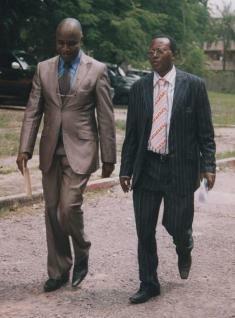 Unfortunately, the false accusations against me and my imprisonment are not isolated cases in Congo – Kinshasa. Under the Kabila government, a large number of lawsuits have been brought against political opponents, defenders of human rights and intrusive investigation by the security services are systematically ordered to identify sources and to track journalists who denounces sensitive information concerning their country. 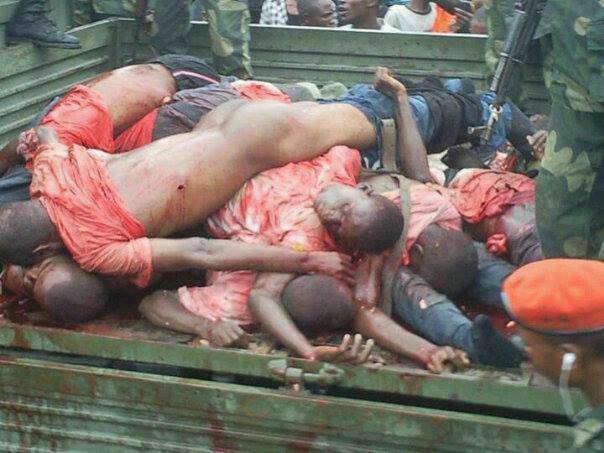 This obsessive tendency of the Kabila government to repress political opponents and its aversion to any public manifestation promoted by the opposition, is undemocratic and cannot continue at the present era, when Africa needs a free Congo. 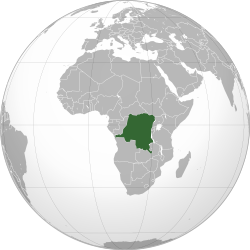 In order to allow the emergence of a New Congo in Central Africa region, a Congo that we want respectful of individual and collective freedoms and able to take advantage of its enormous economic potentialities, Congolese people need the rule of law in their country. I believe that the adoption of repressive measures against individual freedoms as well as the willingness to detain political opponents, constitute a political strategy that is dangerous for instable Great Lakes equilibriums, violating the commitment signed in Addis Ababa Global Accord, to promote democratic process and reconciliation in DRC. You are certainly aware that necessary and urgent reforms of Justice, Army, and Security Services are deliberately forgotten by the kabila regime, which persists in its decadent inertia, in order to conceal its reprehensible acts, bad governance, general corruption and abuse of human rights. Similarly, all those who denounce the indifference of the actual regime regarding real issues of Congolese citizen such as their extreme and widespread poverty, their lack of information, are considered as enemies to destroy. 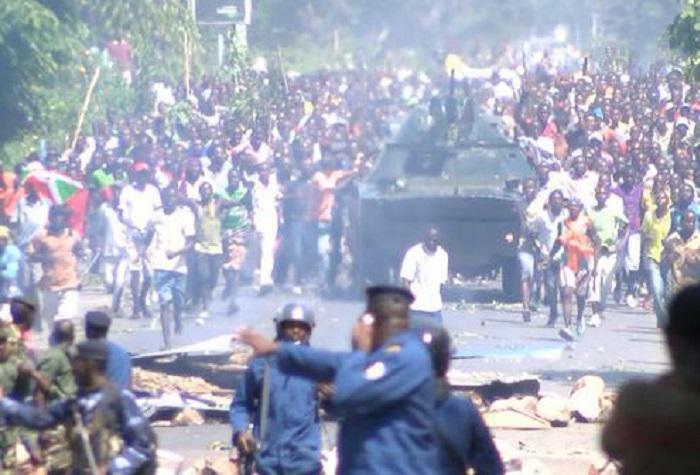 I find it extremely worrying that the current Congolese government continues to use security emergencies to justify deaths of unarmed citizens who are scarified in the name of repressive stability, as in December 30, 2013 and in July 22, 2014 at Kinshasa. The United States support human rights in order to establish good relations among states and among peoples. Continue to protect human rights as well as civil and political freedoms of Congolese citizens, and this in the name of international conventions (the Universal Declaration of Human Rights as well as the International Agreement on Civil and Political Rights). Support the adoption by the American congress of sanctions against all those who conspire against democratic process in DRC and the inalienable right of Congolese citizens to vote as well as to elect their leaders by free elections. In my case, I am ready to pay – and I am already paying – the price to live one day in a free society.